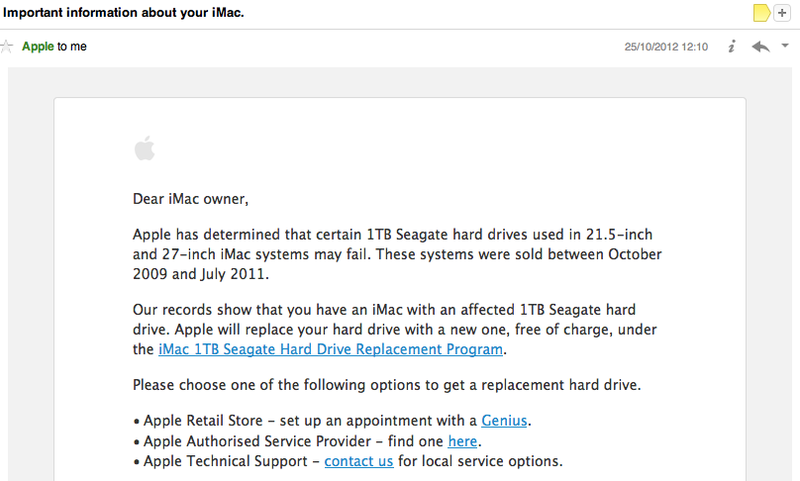 All this week I’ve been preparing to take my iMac in for its replacement hard drive, after getting the email that stated I may have an iMac with a Seagate drive that have now been recalled due to a high failure rate. To cut a long story short, I didn’t end up taking in my iMac for its appointment, instead I used the appointment to sort out my iPhone 5 (that’s a whole other story!) – after speaking with the Apple Genius there, I explained how I had left my iMac at home, manually doing a backup but wondered how long in total they would need it for, when I did bring it in. As I was standing there, an elderly couple bought in a boxed iMac stating they had “got the email” too. The Apple Genius remarked that the “whole of Essex” seem to be bringing them in at the moment when actually, they’re getting to them and finding that many need not be brought in in the first place. He said Apple have no way of determining what is in your iMac, only that you bought it between certain dates, and during those dates, they sometimes used Seagate drives. So, regardless of whether you have a Seagate drive or not, you would have got the email. Most people don’t know how to check what drive they have and so are bringing them in regardless. He said the drives in question are the ST31000 drives, and if your drive starts with anything other than ST, you’re absolutely fine and not affected. 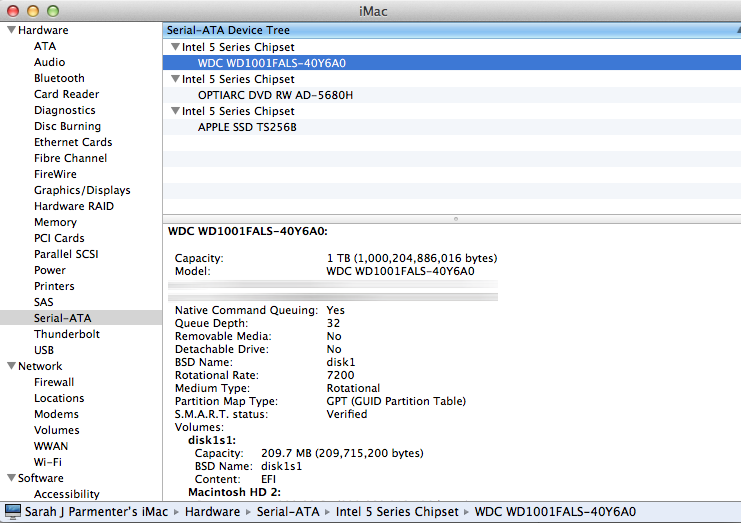 I came home to check what my secondary drive was, (I have an SSD for the OS and Applications) and it was indeed a Western Digital. It would have been an entirely wasted trip. Worth a check before you go dusting off that box in the loft and traipsing up to the nearest Apple store.